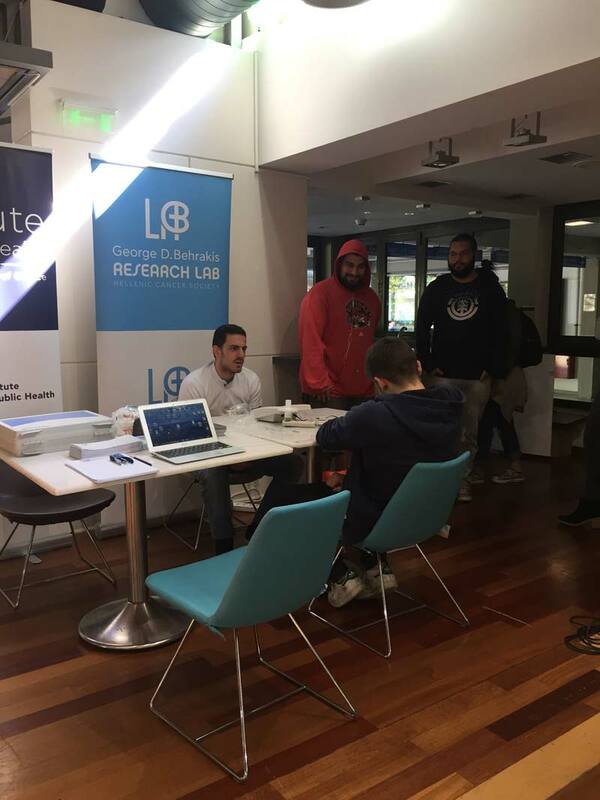 The “George D. Behrakis Research Lab” of the Hellenic Cancer Society participated in the “Mind, Body, Spirit Fest 2017” event of the American College of Greece, offering free Spirometry tests to all staff and students. The event aimed at raising awareness in the ACG Community on health and wellness through activities focusing on health, exercise and nutrition. Giorgos Matiampa and Makis Bakelas, technicians of the “George D. Behrakis Research Lab” performed the tests using mobile spirometry equipment in a designated area. Dr. Anna Tzortzi , pulmonologist, scientific Director of the “Lab” was the supervising physician. Staff and students interested in learning more about their health and lung function were offered spirometry testing and diagnostic interpretation. In cases where further testing was deemed appropriate, participants were referred to the “George D. Behrakis Research Lab” for a free of charge lung function evaluation. Dr. Tzortzi, aside from discussing the test results with each participant, was also available for questions and concerns from smokers and openly discussed smoking health effects of various tobacco products and smoking cessation methods. The Mind, Body, Spirit Fest 2017 was hosted at the ACG Health & Wellness Center on October 10-14, 2017 at Deree, Gravias, 6 Agia Paraskevi.